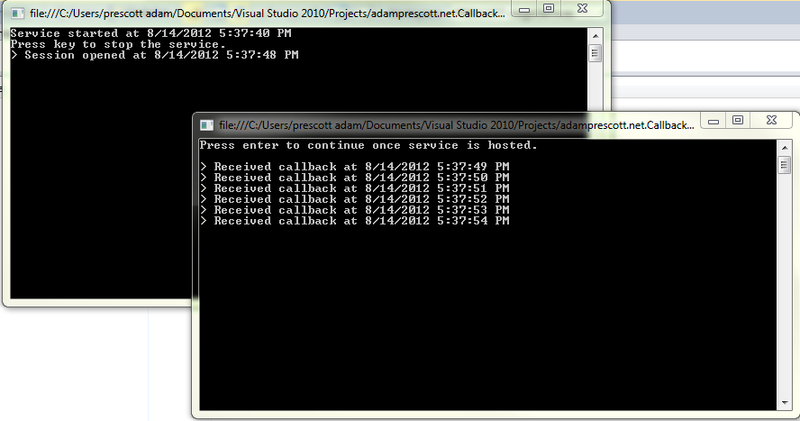 I’ve done a lot with WCF services over the past few years, but I haven’t done much with callbacks. I wanted to write a simple application to understand and demonstrate how a callback service works in WCF. The example described below was implemented in a single solution with two console application projects, one client and one server. To create the service contract, service implementation, and default endpoint configuration, you can use Visual Studio’s menu to choose Add New Item > Visual C# Items > WCF Service. I named my service MyService, and so my service contract is called IMyService. Visual Studio creates the service contract with a single method, DoWork. I decided that I wanted my service to have two methods: OpenSession and InvokeCallback. OpenSession will be used by the server to store a copy of the callback instance, and InvokeCallback will be used to trigger a callback call to the client from the client. To add the service reference, you must have the service running. I did this by simply running the server executable outside of Visual Studio. You can copy the URL from the server’s app.config. Right-click References in your client project, choose Add Service Reference, and paste the URL. I named my service reference MyServiceReference. And that’s all there is to it! This is clearly a simple, unorganized example with few complexities, but it demonstrates the core functionality provided by callbacks in WCF services. This capability allows for push updates and other real-time communication between client and server, and it really opens a world of possibilities. This is certainly a welcome option in my ever-growing development toolbox! Previous PostThe Art of Agile Story WritingNext PostOffice 2013 Preview Display Issues Resolved! I don’t think it’s quite as complicated as you’re making it out to be. MyServiceReference.MyServiceClient is a class generated from adding the service reference. The instanceContext “represents the context information for a service instance” (from MSDN) where you can store data items such as a callback. So, all this line is doing is instantiating a service client proxy while providing it with a callback to provide two-way capability. I didn’t really make it out to be anything; I explicitly referred to how simple it *wasn’t*, and a low count of 3 steps. It turned out to be a ClientBase which has a DuplexChannelFactory. As for your class generated by a service reference, this corresponds to a lot of code-behind and a .config file. All of which depend on IDE help and additional knowhow as to invoking said help. If I were just happening on either your reply or my reply to yours I still wouldn’t be able to decipher the simplicity from the complexity. I’ve found my solution but still, good luck to others, and thanks to you for pointing me in the right direction because you definitely did lead me there. I am new to WCF and tried your example. When I run it I get the error in the client that the CallbackContractType Çlient.ServiceReference1.IMyServiceCallback is not implemented. Do you have an idea what I might have forgot? It’s hard to say without more info. I uploaded my solution to GitHub. Maybe downloading it or taking a look would help? What If i need a service, which startsup and does things even when no client is connected? The constuctor of the wcf is not called when I start the hosting app, but only when the first client connets to it. What if i need somthing to e.g. monitor a value on its own and raises an event in some cases, and when that event occurs does some serverside things (like writing that to a log) and if there is a client conneted raises a callback to inform it? I dont see how to implement that with wcf. You would do this by putting your monitoring logic outside of the WCF service. Start this monitor at the same time you host the WCF service. Then, when clients connect, the WCF service can register the client’s callback to handle events from the monitor. Thanks for the post. It was exactly what I was looking at this moment. One question though. Wouldn’t be better if you have used named pipe? I will try myself. It depends on your scenario. A named pipe won’t work for communication on different machines, for example. Sure. I mentioned named pipes,as in your example the console apps were run on the same computer. Named Pipe or NetTcp binding would possibly better suited for performance and security purposes, if inter process communications or intranet is aimed. Regards. I couldn’t find anything on the internet. Do you have any clue about this ? you shouldn’t add this as a service reference. This is really a nice example. I am trying to figure out how to pass parameters to the callback function and have it return a value. Reblogged this on All about Microsoft .NET development blog. Service ‘Service.MyService’ has zero application (non-infrastructure) endpoints. This might be because no configuration file was found for your application, or because no service element matching the service name could be found in the configuration file, or because no endpoints were defined in the service element. It wont let me post the XML…. Those are the only lines different from your example because my namespace is different. 1- Create WCF service step-by-step. 2- Create the Callback method. I have downloaded your example its works fine, can you tell me how did you added service reference.